Nice weather we are having. Daytime temperatures are in the upper 60s. Nippy in the morning but temperatures in the 40s. It’s about time. We are ready for some cooler weather, if nothing else to get Table Rock Lake to turn over. Pretty much the same generation patterns. However, this weekend, they cranked on a unit both Saturday and Sunday mornings which was not projected. The projection was for a unit in the afternoon….which they did not do yesterday. Not sure what will happen this afternoon. 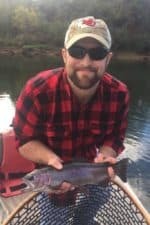 It was okay as it certainly helped fishing! Stan on the water Wednesday with Doc and Terry from Tulsa. Very good day for these two guys on the ruby 2 midge. Friday,. Stan took Rick and Justin, from Kansas, out for the day. Slow start to the day, but it certainly picked up. 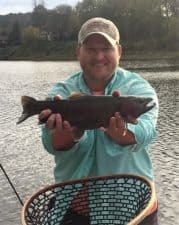 How about this beautiful rainbow? It was the P&P and olive midges. Denny and Doug. They too have a good day mainly on the ruby 2 midge. Mean Bunch of Fly Fishing Women! 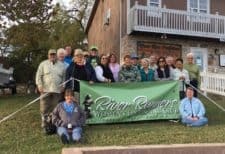 River Runners Women’s Fly Fishing Club invaded Taneycomo this weekend. What a group of fly fishing ladies. 17 women were fishing Saturday and everyone caught fish on everything from the ruby 2 midge to “pre-emergers”. Fun day with five drift boats on the water. Good thing as they cranked on one unit in the morning which limited the wading area. 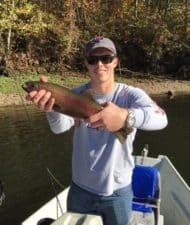 This entry was posted on Sunday, November 6th, 2016 at 3:29 pm	and is filed under Fishing Reports. You can follow any responses to this entry through the RSS 2.0 feed. You can leave a response, or trackback from your own site.